“The settlements I saw here [in the West Bank] reminded me of what we had suffered in South Africa because we also were surrounded by many settlements and were not allowed to move from one place to another freely. The grandson of the late anti-apartheid hero, former South African president Nelson Mandela, is on a “historic visit” to Israel though it seems he will not meet with Israeli officials. During a joint press conference with Palestinian Prime Minister Rami Hamdallah on Monday, Mandela said: “The settlements I saw here [in the West Bank] reminded me of what we had suffered in South Africa because we also were surrounded by many settlements and were not allowed to move from one place to another freely. While meeting with Mandela in Ramallah, Hamdallah highlighted the inspiring legacy of the younger Mandela’s late grandfather. He also stressed the strength of bilateral ties between the Palestinian Authority and South Africa and the historic relationship formed between the late presidents Yasser Arafat and Nelson Mandela. He also praised South Africa’s position in supporting the Palestinian people and championing their cause in the international arena. The two politicians also discussed ways to strengthen their cooperation and advance bilateral relations. Mandela is scheduled to meet with 83-year-old PA President Mahmoud Abbas as well as with other Palestinian officials during his visit. He also will visit Bethlehem, Jerusalem and Arafat’s mausoleum Arafat in Ramallah. Mandela will be in the country until Wednesday. Prior to the four-day visit, he met with Palestinian leader and BDS co-founder Omar Barghouti in Amman. In the past, Mandela has made several calls for the expulsion of the Israeli ambassador to South Africa and has continuously supported the cutting of ties between the two countries. In August, he applauded the South Africa parliament’s decision to shun a delegation of Israeli MKs who were visiting the country. Although Nelson Mandela was critical of “the occupation,” he fully supported Israel’s right to exist. Nelson Mandela has been honored at his memorial by President Obama and countless other world leaders, but a piece of information about his historic life was largely overlooked during the tributes to the late-South African president: The role of the CIA in his imprisonment. A CIA agent inside the ANC provided the South African apartheid government with the location of Mr. Mandela so they could arrest him decades ago. Related report and photos HERE …. Revelations from a CIA operative indicate that the American spy agency was behind the arrest of Nelson Mandela in 1962. Mandela was perceived to be a risk to the US due to alleged ties with the Soviet Union. Those who support boycotting Israeli goods or goods made in West Bank settlements often point to a similar campaign credited with having undermined white rule in South Africa. Israel rejects the comparison, and says the boycotts are aimed at delegitimizing its very existence. De Klerk was the last president under apartheid and, along with Nelson Mandela, ended its systematic racial discrimination. Many in South Africa compare Israel’s presence in the West Bank to apartheid-era South Africa, a charge Israel rejects, resulting in an increasingly strained relationship between the two countries. The former president has also been an advocate of the two-state solution, and in an interview with the Oxford University newspaper in 2014, he said that both Israelis and Palestinians “need to take certain initiatives,” including the recognition of Israel and the establishment of viable borders for a future Palestinian state. “I’m not saying it’s the right solution for Israel, but there will come in Israel a turning point where if the main obstacles of the moment which exist for a successful two-state solution are not removed, the two-state solution will become impossible,” he said. This is what should have been said! led forward by God’s plan. It would be a gross understatement to say that Landau’s formulation was fundamentally flawed. 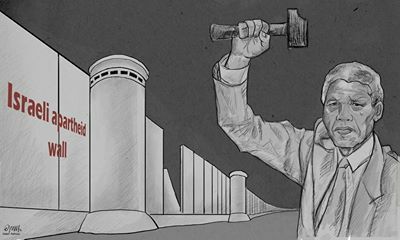 First and foremost, there is a vast amount of evidence proving that Jewish Israeli society – built wholly upon the 19th century premise (and promise) of ethnic and religious superiority, exclusivity, and privilege enforced through ethnic cleansing,forced expulsion, displacement and dispossession, segregation, colonization and occupation – is somehow becoming even more openly racist. Poll after poll revealsincreasingly bigoted trends. The work of reporters like David Sheen and Max Blumenthal, for instance, routinely demonstrates a viciously militarized and unjust society masquerading as an embattled liberal democracy, acting with aggression and impunity. More recently, pogroms targetingmigrants and refugees from Africa, incitement against Palestinians inside Israel, andexplicit anti-miscegenation campaigns are becoming more frequent and more dangerous. Landau’s desperate defense against the apartheid label perfectly demonstrates theLiberal Zionist need to insist that Israel and its founding ideology are not inherently racist, a position less and less palatable to people who are actually paying attention. 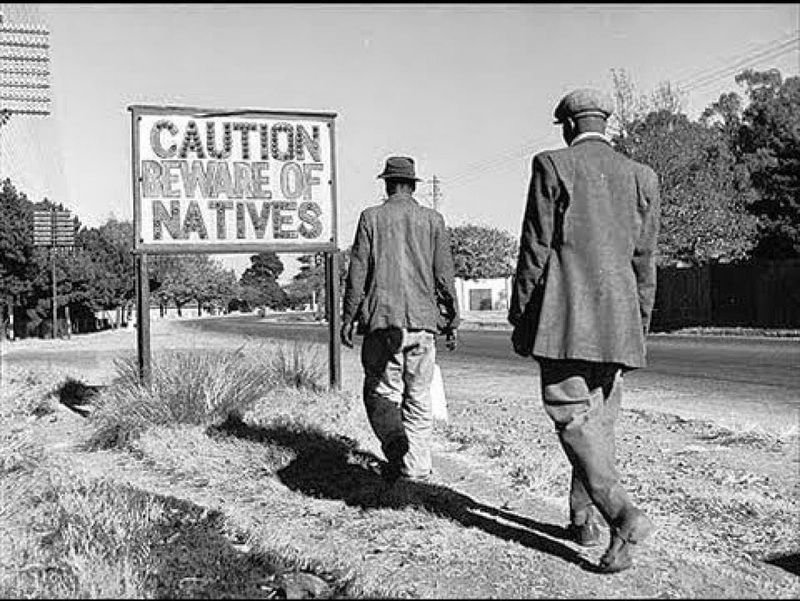 Beyond the shared “promised land” and “chosen people” rhetoric that has inspired boththe Afrikaner and Zionist ideologies of racial, religious, and ethnic supremacy, so has that of land redemption through settler-colonialism and transplanting indigenous populations. 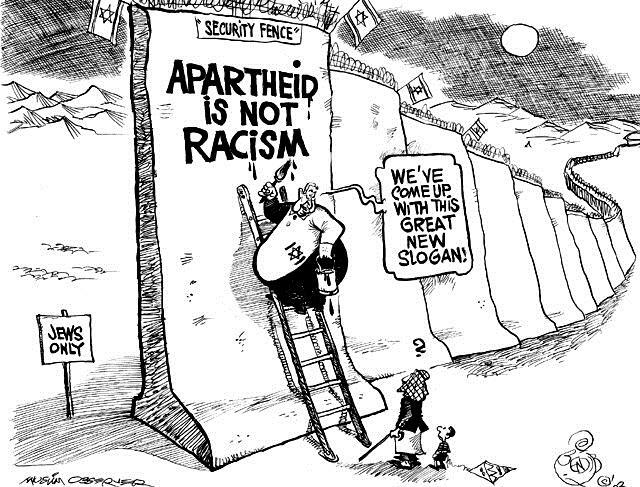 The connective tissue between apartheid and Zionism is thick, and not only in that both European colonial ideologies were officially institutionalized and implemented against native peoples as government policy in 1948. Need I say more to show that this policy of Partnership could, in South Africa, only mean the eventual disappearance of the white South African nation? And will you be greatly surprised if I tell you that this white nation is not prepared to commit national suicide, not even by slow poisoning? The only alternative is a policy ofapartheid, the policy of separate development. In laying out his vision for a bizarre tripartite entity within “Greater Palestine,” with redefined parameters of sovereignty and self-determination in which a “Palestinian government” is established in Amman, Jordan, alongside the Hashemite monarchy, and Israeli military control over the West Bank continues until a final settlement on borders is agreed upon. You obviously have a problem with reading, so these might be of help to you in standing by the original words you muttered … Can you not see the similarities in the images below? Alterman’s only update to Kriek’s logic is his mention of women’s and gay rights, a nod toThe Nation readers’ liberal sensitivities. The late neoconservative war hawk, and long-time New York Times columnist William Safire — who in 2002 insisted, “Iraqis, cheering their liberators, will lead the Arab worldtoward democracy” — also sympathized with white supremacist anxieties about the implications of a single democratic South Africa. The Reagan administration even funded a survey of black South African workers to prove they loved working for benevolent American corporations and adamantly opposed divestment, never mind the fact that advocating for sanctions under apartheid was aseverely punishable offense. *Rania Khalek is an independent journalist reporting on the underclass and marginalized. THE MOSSAD TRAINED MANDELA ???? Now that he’s gone the rumours fly …. BUT …. if you read the second report below you will see that’s all they are …. RUMOURS! 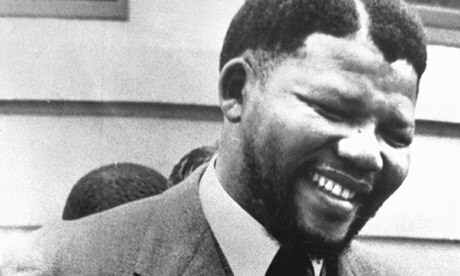 Mandela visited other African countries in 1962 in order to drum up support for the African National Congress’s fight against the apartheid regime in South Africa. While in Ethiopia, he sought help from the Israeli embassy, using a pseudonym, according to the letter – classified top secret – which was sent to officials in Israel in October 1962. Its subject line was the “Black Pimpernel”, a term used by the South African press to refer to Mandela. It went on: “He greeted our men with ‘Shalom’, was familiar with the problems of Jewry and of Israel, and gave the impression of being an intellectual. The staff tried to make him into a Zionist. In conversations with him, he expressed socialist world views and at times created the impression that he leaned toward communism. The Nelson Mandela Foundation has denied an explosive report that the South African freedom icon received training from Israeli agents in the early 1960s. “(The foundation) has not located any evidence in Nelson Mandela’s private archive…that he interacted with an Israeli operative during his tour of African countries in that year,” the group said in a statement to the South African Press Association. Haaretz first reported last week that top secret Israeli files suggest that Mandela was trained by Mossad agents during a stop in Ethiopia in 1962, as he began efforts to launch the armed struggle against the white-led apartheid regime in South Africa. It said Mandela, who died on Dec. 5, apparently underwent weapons training by Mossad agents in Ethiopia in 1962 without the Israeli secret service knowing his true identity. They attributed their report to “an intriguing secret letter lodged in the Israeli state archives”. The letter supposedly said Mandela was instructed in the use of weapons and sabotage techniques and was encouraged to develop Zionist sympathies. 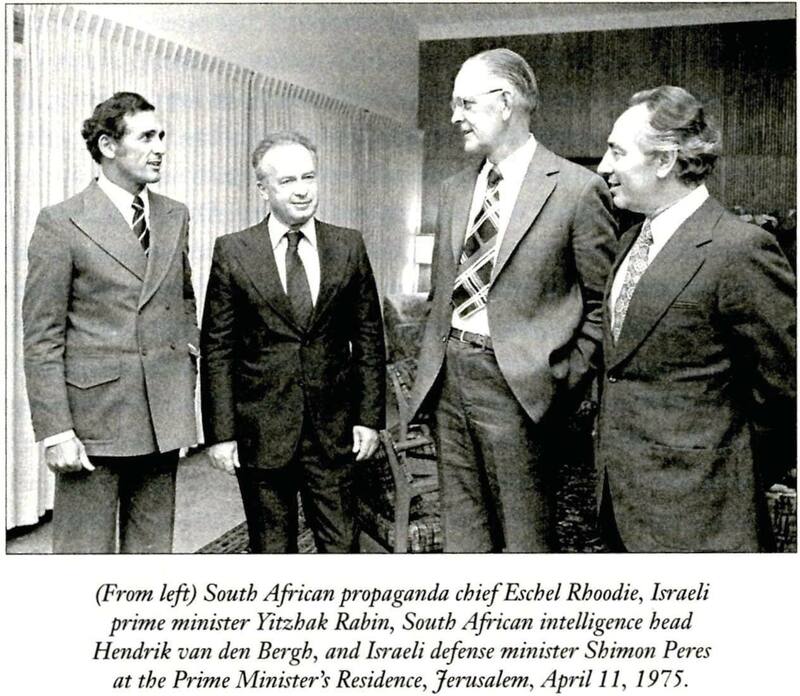 Any contact between Mandela and Israeli agents would have been controversial in South Africa, where Mandela’s African National Congress forged a close alliance with the Palestinians and regularly slammed Israel for propping up the white government. The foundation emphatically denies any such contact between Mandela and Israeli agents occured. “In 2009 the Nelson Mandela Foundation’s senior researcher travelled to Ethiopia and interviewed the surviving men who assisted in Mandela’s training and no evidence emerged of an Israeli connection,” read the statement. These quotes will help you to really know the man …. 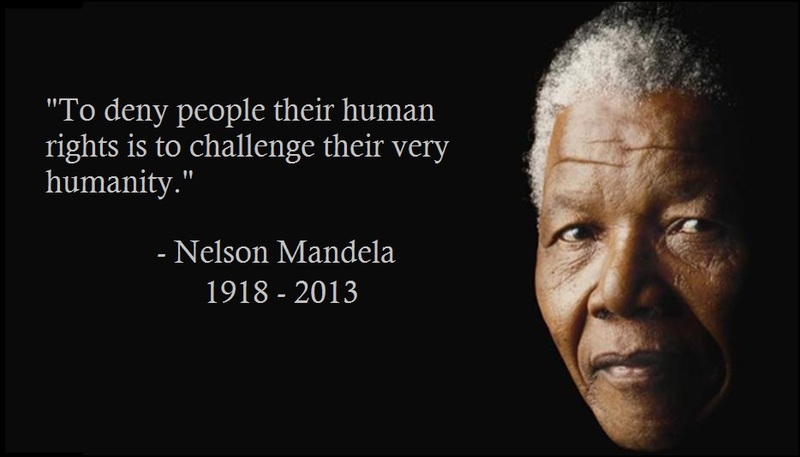 Nelson Mandela, who died yesterday at age 95, was a South African anti-apartheid revolutionary who served as President of South Africa from 1994-1999. During the 1950’s, while working as an anti-apartheid lawyer, Mandela was repeatedly arrested for ‘seditious activities’ and ‘treason.’ In 1963 he was convicted of sabotage and conspiracy to overthrow the government, and sentenced to life imprisonment. 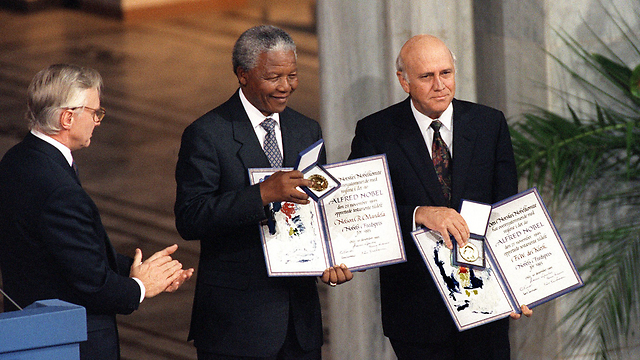 Mandela served 27 years in prison before an international lobbying campaign finally won his release in 1990. In 1994, Mandela was elected President and formed a Government of National Unity in an attempt to defuse ethnic tensions. As President, he established a new constitution and initiated the Truth and Reconciliation Commission to investigate past human rights abuses and to uncover the truth about crimes of the South African government, using amnesty as a mechanism. Endless comparisons between Mandela and Martin Luther King, Jr. will be made in the mainstream; yet few will note that both men were tireless critics and opponents of American aggression and imperialism and reviled by many in the U.S. establishment as threats to the existing power structure. Both consistently linked their own struggles for freedom and equality with global movements for social change, for human rights, for universal dignity. King was relentlessly spied on by the FBI. Mandela languished on the U.S. State Department’s terrorist watch list until 2008. He was almost 90 years old. In the same interview, Mandela pointed out that, while there was “no evidence whatsoever” that Iraq had or was developing WMD, “what we know is that Israel has weapons of mass destruction. Nobody talks about that. Why should there be one standard for one country, especially because it is black, and another one for another country, Israel, that is white.” In all the pieces written about Mandela today and in the future, one must wonder how often we will read these words. “If there is a country that has committed unspeakable atrocities in the world, it is the United States of America,” he added. As he sat in prison he dreamt of seeing the end of apartheid both in South Africa and Israel. Half of the dream has been fulfilled. After 27 years in jail, Nelson Mandela was released from Victor Verster Prison in Paarl (Cap Town), South Africa. The event was broadcast live all over the world. I greet the traditional leaders of our country – many of you continue to walk in the footsteps of great heroes like Hintsa and Sekhukune. Mr. De Klerk has gone further than any other Nationalist president in taking real steps to normalise the situation. However, there are further steps as outlined in the Harare Declaration that have to be met before negotiations on the basic demands of our people can begin. I reiterate our call for, inter alia, the immediate ending of the State of Emergency and the freeing of all, and not only some, political prisoners. Only such a normalised situation, which allows for free political activity, can allow us to consult our people in order to obtain a mandate. The people need to be consulted on who will negotiate and on the content of such negotiations. Negotiations cannot take place above the heads or behind the backs of our people. It is our belief that the future of our country can only be determined by a body which is democratically elected on a non-racial basis. Negotiations on the dismantling of apartheid will have to address the over- whelming demand of our people for a democratic, non-racial and unitary South Africa. There must be an end to white monopoly on political power and a fundamental restructuring of our political and economic systems to ensure that the inequalities of apartheid are addressed and our society thoroughly democratised. It must be added that Mr. De Klerk himself is a man of integrity who is acutely aware of the dangers of a public figure not honouring his undertakings. But as an organisation we base our policy and strategy on the harsh reality we are faced with. And this reality is that we are still suffering under the policy of the Nationalist government. Our march to freedom is irreversible. We must not allow fear to stand in our way. Universal suffrage on a common voters’ role in a united democratic and non-racial South Africa is the only way to peace and racial harmony. Not long after Band Aid and We Are The World focused musical attention on poverty and famine, a collection of artists took a similar approach in the struggle against apartheid. The initiator was Steven van Zandt – erstwhile guitarist in Bruce Springsteen’s E Street Band – who whipped up dozens of musicians to work on the project. They included Peter Gabriel, members of U2, Springsteen himself, Hall and Oates, Bob Dylan, Ringo Starr, Run DMC, Lou Reed, Jackson Browne and Keith Richards. Van Zandt wrote and produced the song and it reached the top 40 in several European nations, though not in the US. Plans for the funeral of South Africa’s iconic former leader Nelson Mandela are already in place, even though his health is currently reported to be improving. Mandela will be buried 10 days after his eventual death and a huge memorial service will be held in Johannesburg’s Soccer City. According to documents seen by the Daily Mirror, the main memorial will take place at the 94,000-seat stadium that hosted the 2010 World Cup Final, Mandela’s last major public engagement. However, a source has also said the plans have become a “logistical nightmare”, and that the funeral could take place up to 12 days after he dies. The documents show his body will be moved to a military hospital on the outskirts of Pretoria. He will lie in state for three days, allowing members of the public to file past. Mandela will be buried in his home village of Qunu, in a ceremony to be attended by 450 relatives and dignitaries. Books of condolences will be opened at the Union Buildings in Pretoria as well as designated places in other cities. A source told the Mirror: “The original plan was a strict 10-day affair with the memorial service on Day 5 and the funeral service on Day 10. “But a little flexibility has now been included because we want every world leader who wants to attend to be able to do so. “After Madiba dies his body will be transported reasonably quickly to One Military Hospital at Voortrekker Street on the outskirts of Pretoria. The hospital is run by the South African Military Health Service. “Each province will have its own memorial service but the main one will be in ‘Soccer City’ in Johannesburg, where Spain lifted the 2010 World Cup. Mandela has been in hospital in Pretoria since 8 June, when he was admitted with breathing difficulties. His condition had been described as “critical” but his family has since said his health is improving. The anti-apartheid hero wrote out his request to be buried in Qunu on a piece of A4 paper, it has been revealed. The word “Freedom” is tossed about in contemporary political rhetoric quite often and yet it is poorly understood. It is heavily loaded with both partisan and sentimental value for those who use the word, and it cannot be easily defined for it not only represents the foundation of what the United States was ostensibly founded upon, but it is the watchword for all “democratic” nations. “Freedom” is our aspiration; in its absence we are enslaved, in its presence we are jubilant … but what does “freedom” really mean? Understanding the concept of “freedom” is easier when you can comprehend what it means to live without freedom: to appreciate the lack of something permits us to better appreciate what it is like when it is made manifest in our presence. A perfect example of this can be found in 20th century history in the nation of South Africa and the tumultuous times of the Apartheid regime that imprisoned Nelson Mandela for 27 years. Nelson Mandela was only one of the political prisoners who lost his personal freedom in the battle for freedom for his people; that was the sacrifice that he made in order to see the hateful Apartheid system end, and for a nonracial system of government to come into being. The fruits of his freedom were manifested through the first “one-person-one-vote” elections in 1994, which marked the true end of apartheid. The subsequent establishment of the Truth and Reconciliation Commissionwas emblematic of this freedom as well. It was convened for the sake of creating a public record about what took place under the apartheid regime, to rehabilitate the nation after living through the ravages of the racist apartheid regime and, more importantly, to compensate those who had been abused under the old apartheid system rather than meting out revenge against those who had perpetrated the offences. According to Nelson Mandela, freedom can only exist when everyone is free. In other words, freedom in not a personal issue, it pertains to the collective state of the people. Inequality is a great hindrance to true freedom as it creates distinct divisions (or classes) amongst the population that transcends traditional class structures. Having any class system in society, either according to job classification or based on religious belief, you will find that the issue of freedom is stunted by the idea that there is anything that differentiates one individual, or group of individuals, from others. One of the things that you discover by studying the situation that took place in South Africa, and the story of Nelson Mandela, is that freedom and racism are integrally related. When a man can have 3 decades of his life stolen from him because the state opposes the way he thinks, or his dream to live in a free state that does not treat him and his people like 2nd class citizens, that is when you know there is no freedom to be had. Freedom in South Africa, before the end of Apartheid, was an illusion for the simple reason that it was something that only white citizens were able to partake of, so long as they adhered to the barbaric laws of the apartheid regime. 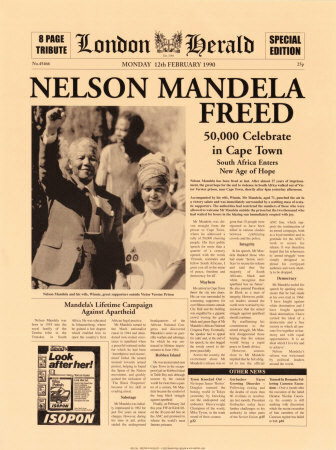 When Nelson Mandela walked out of prison after 27 years he was a free man, but he would not know true freedom until he had the opportunity to cast his vote in the first “one-person-one-vote” election in South Africa on April 26, 1994. Over the days that the polls were open nearly 20 million South Africans of all colours cast their votes for who would represent them in the first non-white-only government. The African National Congress won the majority of support with 62.6% of the vote and, on May 9, 1994, Nelson Mandela was unanimously elected President by the National Assembly. The days of the elections were so important to the people of South Africa that the 27th of April was declared a public holiday: Freedom Day. As the president of the “new” South Africa it is likely that Nelson Mandela did not, at that point, feel very much like a free man for the simple reason that his time was not his own, something that every head of state would likely agree with were they asked the question of their own situation. In his book “Long Walk to Freedom” Nelson Mandela wrote that “a leader often sacrifices personal freedom in order for a leader to serve the needs of his people” (paraphrased). It is a variation of the idea that personal sacrifices must be made in order to help others. That is the essence of being a truly great leader, of being a truly great human: someone must be willing to give of themselves for the betterment of others. In answering the question, “am I my brother’s keeper”, the response is “yes”, without hesitation, even if that costs something on a personal level. True freedom, after this model, comes from the expression of an individual’s interpretation of a rather esoteric ideal, an expression that is almost impossible to define in traditional terms as it encompasses so many definitions. People ultimately cobble together their own interpretation of the word, regardless of whether or not it is close to being an accurate definition. When it comes to an individual’s idea concerning freedom there really is no “right answer”, and the truth is an altogether different and irrelevant point to those who believe that “freedom” is a “God-given right”, guaranteed by the Constitution of the United States (for those living in the United States … Canadians have the “Charter of Rights and Freedoms”). Alas, this is where the idea of “true freedom” enters the concept of relativistic or situational definitions. Some might argue that true freedom is an absolute that cannot be measured against perceived rights and “freedoms” that are conferred upon an individual by the state. At the same time, true freedom cannot be represented by anything that the state can confer upon a citizen for the simple reason that rights and freedoms conferred by the state can be taken away just as easily as they were granted; that does not make the idea of freedom very concrete if it is something that can be removed by a court decision or governmental decision, it makes it sound more like a vague concept that is “open to interpretation” rather than an entrenched right. Take, for example, the right of “Habeas Corpus”, which has been an important part of common law since before the Magna Carta (1215). This “right” was taken away from people in the United States, with the stroke of a pen, after President George W. Bush decided that terrorists did not deserve the same rights as those guaranteed under the constitution to all other defendants. One of the main problems encountered by people attempting to formulate a concrete definition of the idea behind “freedom” comes when an individual’s expression of their freedom impinges upon another person’s ability to enjoy their life. The problem with individual freedom is that, for the most part, people do not live their lives in such isolated situations that make it possible to do anything they want without having to be concerned with the ramifications of their actions. True freedom does not necessarily mean doing anything you want, whenever you want; it means that you are free to make choices to do the right thing, those things being things that do not interfere with the lives and livelihoods of others. What is truly important is that we are given the ability to make the proper choices when it comes to the exercise of this freedom which is why education is one of the most important things in a “free” society. Without an educated population it is impossible to have a citizenry who understand what their responsibilities as citizens are and, subsequently, what their freedom represents. Education is the cornerstone of a free society insomuch as it serves to provide a level playing field for every citizen, regardless of their position in society. Where there is an educational system that treats its students with dignity and respect you will find a citizenry that appreciates their freedoms without seeking to violate the rights of others; civility is as much an element of cultural decontamination as it is a part of the permissive nature of the society from which an individual is from. When people believe they are allowed to do anything because it is their “right” to do so, that they are exercising their freedom, the violation of the rights of others will take place more and more frequently for the simple reason that they will not care whether or not their actions have ramifications outside of the immediate moment in which they are operating. This is the great conundrum of freedom that may never be fully satisfied: is one individual’s freedom more important than the freedom of all? What happens when your freedom interferes with another person’s life? Is the pursuit of the one supposed to supersede the other or, are you to alter your plans to accommodate the society of which you are a member? Perhaps the definition of freedom has to include the word “sacrifice”. The very concept of freedom, from the beginning of modern history, is fluid as can be seen through the history of the United States and its Declaration of Independence. In the Declaration of Independence there are the famous words declaring that we are all endowed with the unalienable rights of “Life, Liberty, and the pursuit of Happiness”. One may infer that “freedom” was on the tip of the tongue of the writers of the Declaration, even if it was not actually written down: the words chosen are all synonymous to freedom. However, it must also be remembered that the Declaration of Independence was aimed at a particular crowd: white, male landowners. Women and people who were not white were not considered in the same category as the landowners, nor were they given the right to vote or speak in government. Freedom was not for all; not then, or now. The very idea behind the “pursuit of Happiness”, for example, can cause contention amongst those who do not share similar views of what that pursuit may actually entail. While one person may feel the pursuit of happiness includes the playing of drums in the middle of the night, their neighbours would likely feel somewhat differently about that expression of freedom and ask the drummer to change their schedule for the sake of community harmony. By playing their drums at another, more appropriate time of the day, it is possible for the drummer to have his pursuit of happiness – to have his expression of freedom – without having his neighbours want to burn down his house in the process. Freedom is something that will be debated for generations, but the true definition is really not that difficult to find as it relates to the entire human condition; it must be seen as a relativistic term in regards to how we all live, or it holds little personal meaning: if one person thinks themselves to be free while their brothers or sisters are not, what is the value of their freedom? Unless we are all free, unless we are all endowed with the same rights and privileges that every citizen is entitled to enjoy, freedom will remain nothing but a concept to be discussed in university classes and high school civics classes. 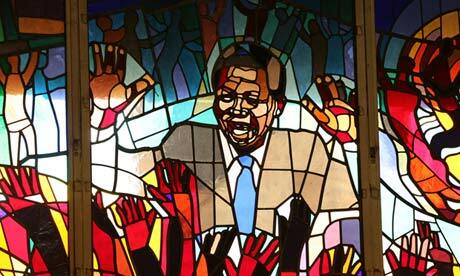 When Nelson Mandela spoke to 120,000 supporters in the First National Bank Stadium in Soweto, South Africa, he addressed the fact that there had been problems with crime in the township. Crime had to end, Mandela pleaded, for “Freedom without civility, freedom without the ability to live in peace, was not true freedom at all.” In the end, freedom is more about the things we decide not to do than what we decide to do; it means we are free to live our lives in harmony with each other, regardless of colour or creed, in peace, because that is the way we should be living. It isn’t about doing things that risk the lives of others so that we can have a fleeting thrill. Irresponsibility is not an expression of freedom, it is an expression of immaturity. 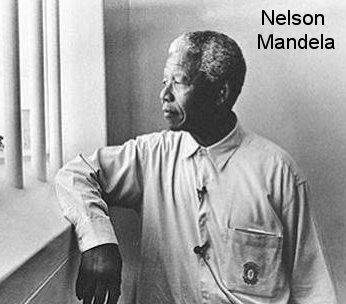 Freedom is something that, after 27 years in prison for political beliefs, Nelson Mandela could say he understood by virtue of the fact that he could have a meal when he pleased and sleep when he wanted. The little things become precious when you have had everything stolen from you. Ultimately freedom is what you make of it, it is the lifeblood of our democratic system: we are free to vote, to choose those who will represent us in government and ultimately shape the course that our nation takes in national and international affairs. Our greatest task as freedom loving citizens begins at the ballot box whenever there is an election: if we fail to vote we fail our nations. We abdicate the responsibility that our government expects from its citizens. If we do not vote, if we do not use our freedom to express our opinions at the polls, how can we be surprised when a reactionary political entity is elected that wants to curtail those personal rights and freedoms? Any right conferred by the state can be taken away: we must never allow this to happen. The only way to prevent it is by speaking through our votes. If we do not vote, if we allow apathy to overtake our love for freedom, the damage will have been done. Just remember, if you do not vote, you are entrusting your freedom to the people who do. The South African Zionist Federation and importers of Ahava – one of the companies singled out in the government’s notice to label Israeli-made goods produced beyond the Green Line – launched a court application on July 5. The South African Zionist Federation decided to play hardball after realizing that negotiating with Trade and Industry Minister Rob Davies would lead nowhere. JOHANNESBURG – Nearly two weeks after South Africa’s government adopted a regulation to label goods produced in the West Bank as originating from the “Israeli Occupied Territories,” it has emerged that the country’s Zionist Federation decided long before then to take the issue to a Pretoria court. The South African Jewish community was outraged by the cabinet’s decision on August 22 to ratify the measure first proposed on May 10 by Trade and Industry Minister Rob Davies. His office placed a notice in the Government Gazette (where all government business is published), saying it wants merchants “not to incorrectly label products that originate from the Occupied Palestinian Territories as products of Israel.” The regulation also holds merchants responsible for identifying the provenance of products they sell. Yet it has come to light in recent days that while some Jewish groups made a submission to parliament in response to the notice, the South African Zionist Federation has been quietly working on taking the matter to court, in an attempt to have the measure declared fatally flawed (legally-speaking), and therefore invalid. Their application avoids dealing with the bigger political issues at hand – the labeling or boycott of Israeli-made goods – and instead focuses on technical aspects of Minister Davies’ notice, which the Zionist Federation’s attorneys said were deficient. Avrom Krengel, chairman of the South African Zionist Federation, said that the technical legal approach might ensure that the matter is heard relatively soon, possibly before the end of the year. If the notice that launched the labeling is invalidated, the entire process that followed would also be nullified, said Krengel. 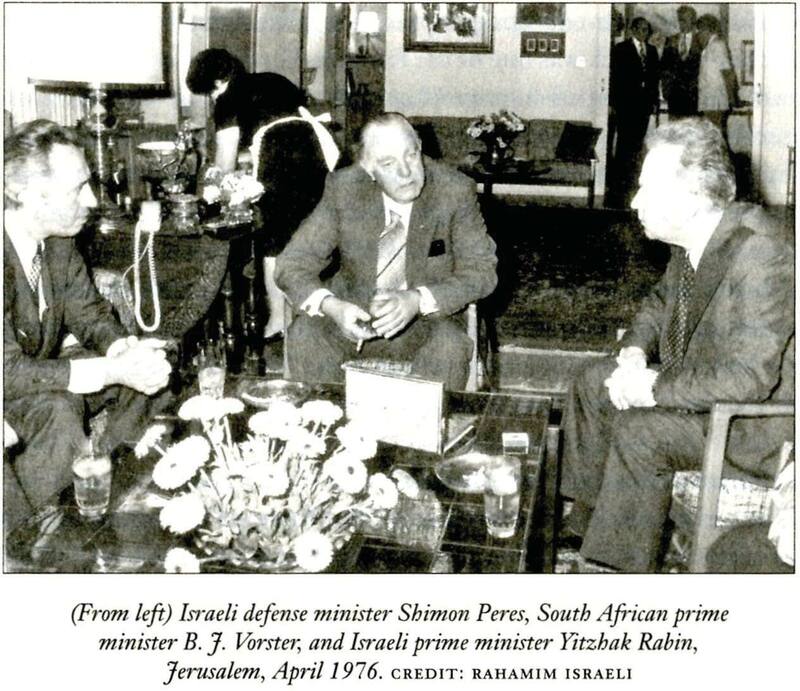 Krengel explained that after South African Zionist Federation realized that Davies was playing hardball on the issue, his group resolved to eschew negotiation with the minister, whose meeting with Jewish community leaders was not cordial, and to return fire with fire. “It seemed clear that we weren’t going to get anywhere by talking to the minister, so we took [our lawyer’s] advice and decided to let the courts deal with the issue,” Krengel said. 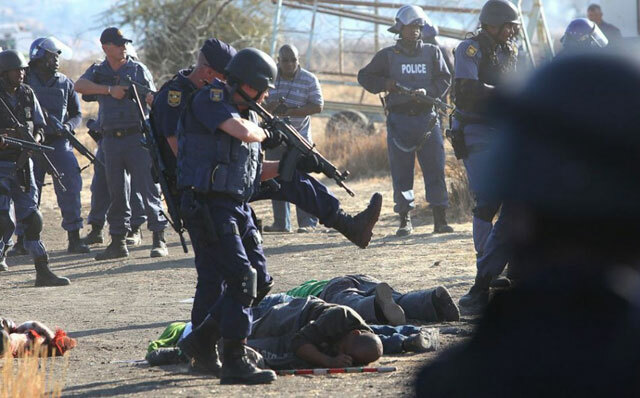 The South African Zionist Federation has joined a number of other organizations that have found it necessary to “go to the law” if they want action, or a reaction, from the government. There has been an increasing trend over the last two years to take contentious matters to court. One of the best-known cases happened about two months ago, when the NGO Section 17 successfully sued the Basic Education Ministry because of its inability to deliver textbooks on time to schoolchildren in the Limpopo province. The Zionist Federation’s Krengel said that as a result of the litigation process, his organization has been given access to documents in the general “file” on the issue of labeling Israeli-made products from the West Bank. 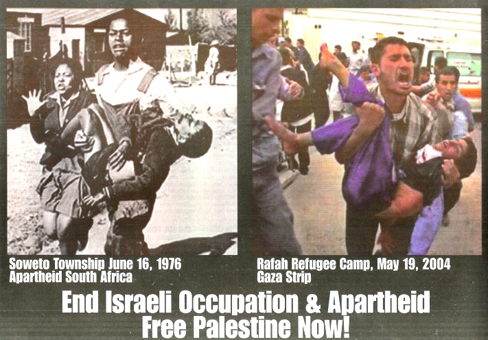 A film still highlights the parallels between South African and Israeli aparthied policies. Not only is Roadmap the first documentary to offer an in-depth exploration of parallels between the South African and Israeli forms of apartheid, but it presents the material in such a way as to serve as a fairly comprehensive and accessible introduction for audiences with no prior exposure to the issue. Few films are ever made about the “parallels between x and y,” no matter how salient the comparison. The challenges of crafting such a film — structural, technical and otherwise — are many, and daunting even to the most experienced filmmakers. Yet first-timers Nogueira and Davidson have assembled a work which, at moments, rivals anything by heavyweight documentary artists like Errol Morris. The sophistication of filmmakers’ technical skills is readily apparent throughout the film, which looks like anything but a first-time effort. Roadmap employs striking data visualizations, animations and split screen effects, but does not overuse them. Decades-old footage is smoothly integrated with modern material, and the original footage is remarkably well-shot. The interviews employ a variety of different camera angles which help maintain an organic, conversational tone that never feels monotonous, and much of the on-the-ground footage of demonstrations and military incursions has an immersive, kinetic quality that pulls the viewer into the action. The sheer breadth of the aspects of Israeli and South African apartheid that the film explores and compares will likely exceed the expectations of many viewers. The filmmakers cover nearly everything: siege mentality colonialism, forced migration,checkpoints, passes, foreign natives, present absentees, partition and proxy rule, bombing and boycotts, bulldozers and Bantustans. Refugee issues, central to understanding Palestine, get less screen time, but this is mainly because this is one of the numerous ways in which the Israeli form of apartheid, as journalist Allister Sparks puts it, is “significantly worse than apartheid” in South Africa. Some of the transitions and comparisons work better than others, but those which work best, such as the juxtaposition of a Boer laager and Israel’s infamous wall in the West Bank, work remarkably well. That the film explores parallels not only between the physical aspects of apartheid, which are many and varied, but the psychological dimensions, for colonizer and colonized alike, is important. 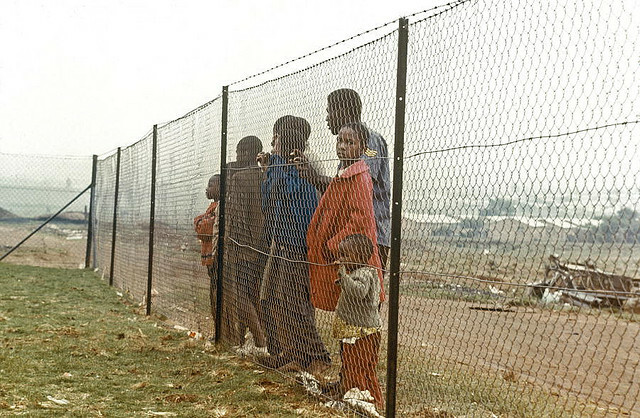 The most powerful moments of the film, in which the strongest links between the two forms of apartheid are made, are those which depict an emotional experience common to both struggles. “There is no pain quite like being unloved, unwanted, in one’s own land, among one’s own kind,” laments South African poet Don Mattera, whose mesmerizing voice dominates several of the film’s most emotionally resonant moments, including a heartrending journey into the mind of a person watching as their home is physically destroyed. So powerful are Mattera’s words and voice that they tend to overshadow the uncharacteristically flat tone of the film’s narration by Alice Walker. Of course, if one of your film’s worst problems is that someone managed to outdo Alice Walker, you probably don’t have that much to worry about. The film is packed with insights from the world’s leading authorities on both South African and Israeli apartheid, including Diana Buttu, Na’eem Jeenah, Jeff Halper, Yasmin Sooka,Ali Abunimah, the late Dennis Brutus, Salim Vally, Ziad Abbas, Eddie Makue, Angela Godfrey-Goldstein, Jonathan Cook, Jamal Juma’, Allister Sparks, Sasha Polakow-Suransky, Phyllis Bennis and others. Among this group, it would have been nice to hear from more black South Africans, and more women, but the film does manage to assemble a good mixture of very smart people saying very smart things. Perhaps more importantly, the film includes just as prominently the voices of many ordinary South Africans and Palestinians who are experts on apartheid in their own right, by virtue of suffering, surviving and resisting it through the course of their own daily lives. The voices of ordinary Jewish Israelis are also included, exploring how Israeli apartheid offers them all manner of colonial privileges while erecting physical and psychological barriers that largely prevent them from observing its direct impact upon the indigenous Palestinians. The discussion of home demolitions, a practice common to both Israeli and South African forms of apartheid, does seem to take a bit longer than it should, but is undoubtedly one of the highlights of the film. Some answers to that question may be found in the film’s closing segment, which examines individual and collective resistance to apartheid, and frameworks for imagining a shared future based on freedom and equality for all people. 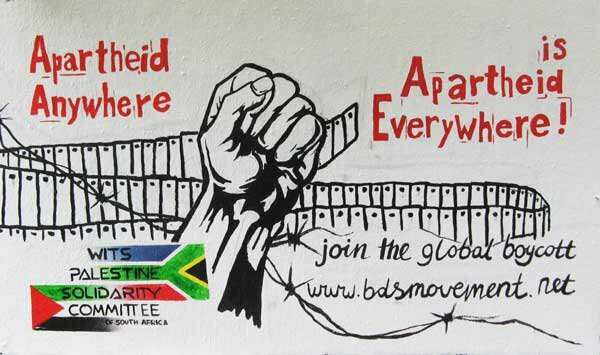 The global campaigns for boycott, divestment, and sanctions which helped end apartheid in South Africa, and which are well on their way to doing to same in Palestine, are discussed, but the emphasis here is more on the outcome than on the strategy. Roadmap to Apartheid premiered in New York City on Friday, 22 June. For more information and screenings, visit their website at roadmaptoapartheid.org. *Abraham Greenhouse is a longtime Palestine solidarity activist and blogger for The Electronic Intifada. Follow him on Twitter at @grinhoyz. 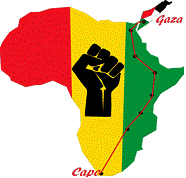 Without fanfare or publicity, a solidarity group from South Africa arrived in Gaza Thursday night. They brought 10 trucks of much needed medical and humanitarian supplies with them…. The 36 activists will meet with figures who work on the issue of Palestinian detainees in Israeli jail, a Ma’an correspondent said. The group brought 10 trucks of medical and humanitarian supplies, entering through the southern Rafah crossing between the Gaza Strip and Egypt. An Israeli mission is being sent to five countries to do pro-Israeli propaganda work at campuses. The mission has been briefed and trained by the Israeli Ministry of Foreign Affairs and the Israeli Ministry of Public Diplomacy and Diaspora Affairs. Furthermore, they have received funding from the Ben-Gurion University and Weizmann Institute of Science student unions. These youtube diaries document the mission’s attempted propaganda visit to South African campuses.In this installment – Day 1: OR Tambo International Airport – students who planned a creative protest at the arrivals terminal of the airport speak about the measures that the Hasbara group had to take to “sneak into the country like spies”. 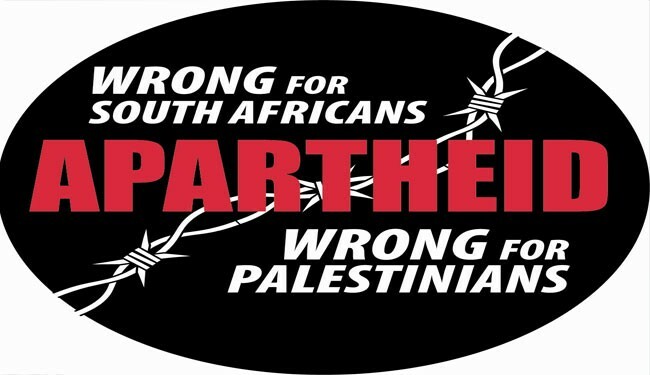 Palestinian students have written to South African peers asking students to challenge and boycott the upcoming Israeli trip to South Africa which is meant to begin on the 11th of August 2011. 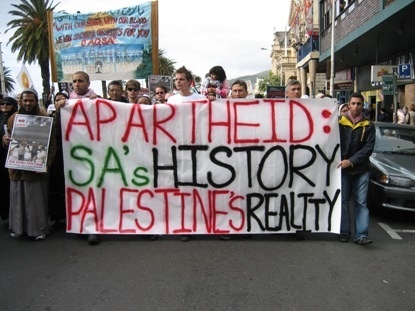 In response, the SA Union of Students; South Africa’s oldest and largest student group, SA Students Congress; and the Young Communist League of South Africa have issued a joint statement that slams the “Israeli Apartheid Agents” mission to South African campuses and they encourage all local structures to investigate and implement boycott of Israel campaigns was issued. ‘The Ahava products were falsely labelled to appear as though they were from Israel, yet in fact were made in the Israeli settlement Mitzpe Shalem in the occupied West Bank,” one of the protesters said. 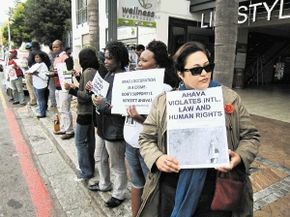 Lining up in the forecourt of the retail store in Cape Town’s up-market Kloof Street on Saturday, human rights activists called a boycott of the business outlet. They held up placards and sang. Some placards read: “Boycott Ahava for a free Palestine”, “Israel occupation is a crime, don’t support it, boycott Ahava” and “Wellness Warehouse remove Ahava products made in Occupied Palestine”. 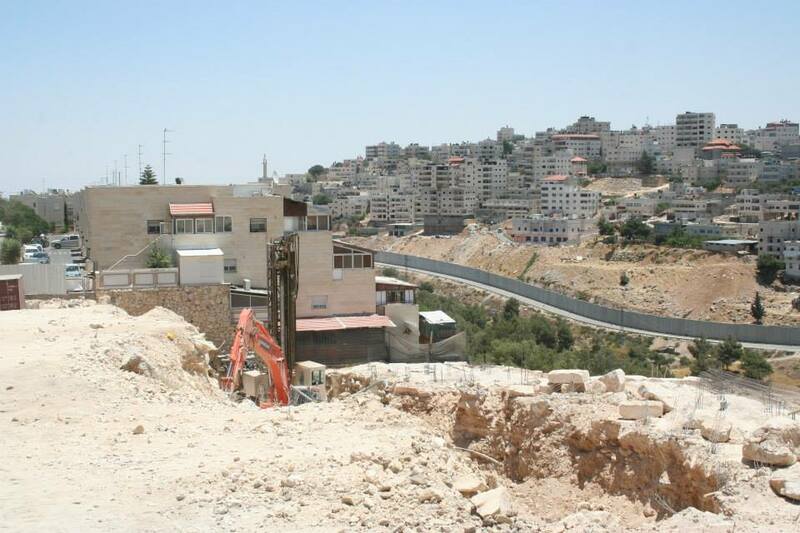 They accused the owners of violating international law and “infringement of the rights of the Palestinian people”. Daniel Kamen, Open Shuhada Street (OSS) education coordinator said they stood for the rights of both Palestinians and Israelis. The OSS organised the protest. He said his group would take up the issue of false labelling with the National Consumer Commissioner. He said that before they took to the streets since last August they had tried to sort out the matter through correspondence with Wellness Warehouse chief executive Sean Gomes. “We appealed to Wellness Warehouse’s claim that it ‘cares for the earth and its people’, and requested that Gomes discontinue the sale of Ahava. In response to the request Gomes had said that his store was but “one of a number of retailers, health shops and spas”, in SA that stocked the products. “Wellness Warehouse is not the importer, but purchases Ahava from a local importer. If a product is deemed to be contravening any law and this is confirmed and sanctioned by the South African trade authorities and government, we will take the necessary action at that time,” said Gomes. We often hear people ask; “Where is the Palestinian Gandhi”? 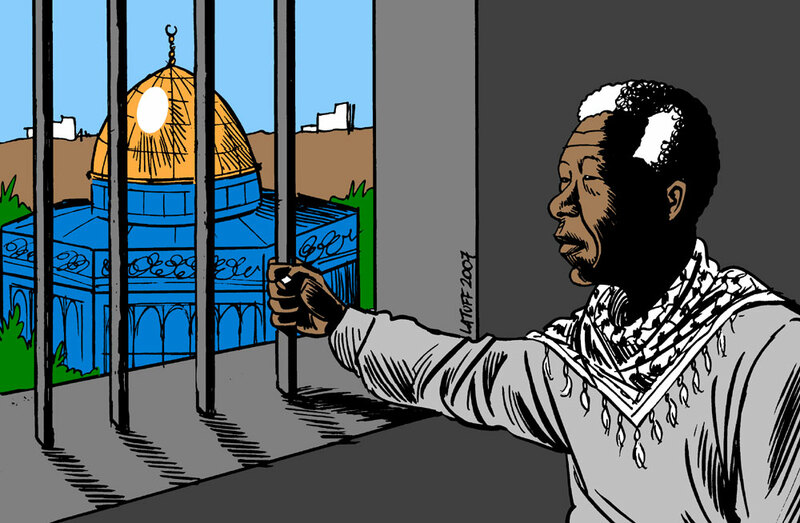 We rarely hear; ‘Where is the Palestinian Mandela”. BUT…. that is exactly what Palestine needs today. A leader with integrity, dedication to his people and willing to take risks. 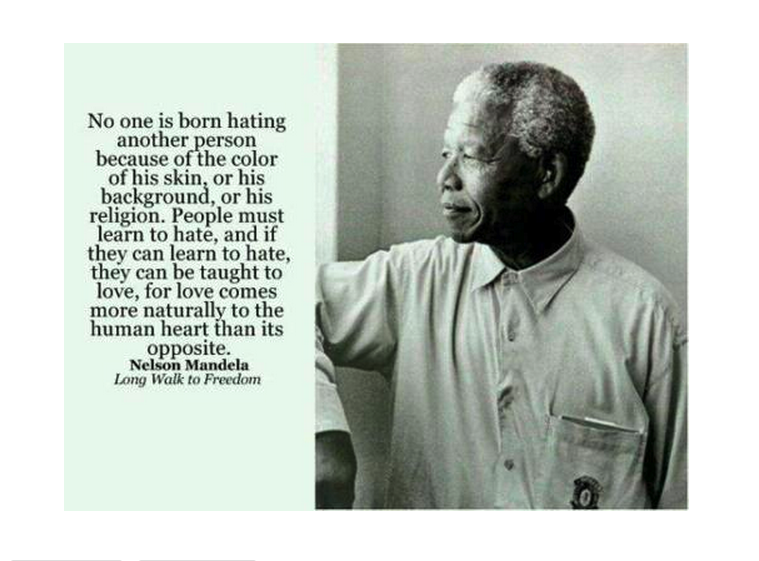 My son wrote a brilliant piece the other day about Freedom….about Nelson Mandela. 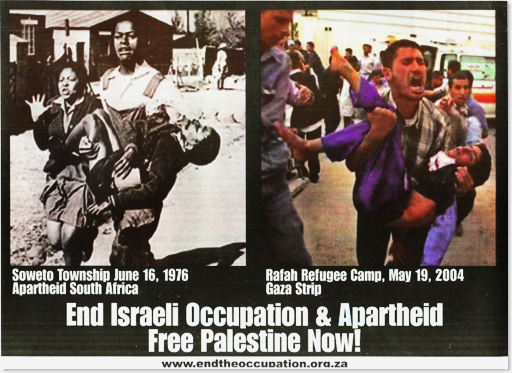 So many of the circumstances of Apartheid South Africa and Apartheid Israel are similar… surely we need similar leadership to combat this. Understanding the concept of “freedom” is easier when you can comprehend what it means to live without freedom: to appreciate the lack of something permits us to better appreciate what it is like when it is made manifest in our presence. A perfect example of this can be found in 20th century history in the nation of South Africa and the tumultuous times of the Apartheid regime that imprisoned Nelson Mandela for 27 years. Nelson Mandela was only one of the political prisoners who lost his personal freedom in the battle for freedom for his people; that was the sacrifice that he made in order to see the hateful Apartheid system end, and for a nonracial system of government to come into being. The fruits of his freedom were manifested through the first “one-person-one-vote” elections in 1994, which marked the true end of apartheid. The subsequent establishment of the Truth and Reconciliation Commission was emblematic of this freedom as well. It was convened for the sake of creating a public record about what took place under the apartheid regime, to rehabilitate the nation after living through the ravages of the racist apartheid regime and, more importantly, to compensate those who had been abused under the old apartheid system rather than meting out revenge against those who had perpetrated the offences.